I am a creature of habit when it comes to my daily ride. It feels like I’ve veered off into the ditch of doom when I don’t get my daily spin. The biggest obstacle with the start of the 2017 year has been wind, freezing rain and snow. I ride through most weather conditions, but ice is not nice. 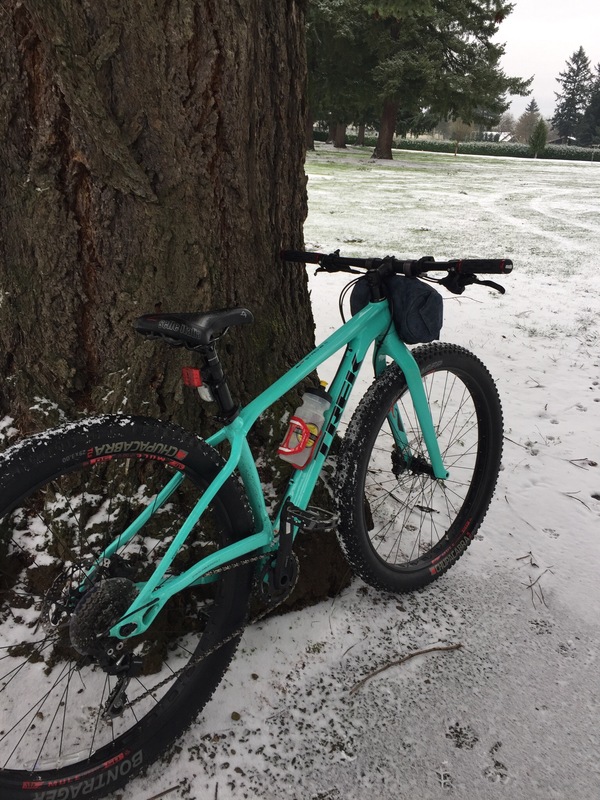 I got out yesterday on the fatty bike since we had something more than a dusting, but less than an inch of the white stuff. A short, cold ride was totally worth it until I couldn’t feel my hands or take pics, but then today the freezing rain started and the wind is about 38-45 mph and the temps drop to the teens and I’m spending time researching Zwift and smart trainers. I can’t go out and buy something because of the aforementioned snow and ice, but I am learning about some of the desireable features. Please feel free to tell me what you think in the comments. I’d appreciate constructive feedback on trainers and Zwifting. My budget is $550 or less. I am not training for something other than life, y’know. Being a healthy, fit person. I like to ride everyday and when weather derails the day, I want a back up. Truth be told: I will always be a slow poke. I have an active imagination, but I know the podiums exist only in my imagination. I don’t care! I do enjoy the competition I see on the Zwift boards. I mean it doesn’t matter to me if I am on a ride and I’m dead last. I’d prefer being alone and going at my own pace. Now I hope my performance doesn’t adversely effect the peloton, but from what I can see I can have a nice workout and enjoy some interesting scenery. It won’t be the same as outside, but I’ll have a ride which isn’t compromised by the weather. TACX Satori Smart Trainer gets decent reviews and price point is okay. Kinetic Road Machine Smart Trainer is one I’ve seen in bike shops. It costs a bit more than the Tacx and that’s about all I can see that’s different besides the look of it. Elite QUBO Digital Smart B+ comes in at about $250, but gets low marks on its Bluetooth connection. KickR Snap by Wahoo is very cool but it’s over budget. I’m also considering the usual suspects like Cyclops and giving up on the resistance training. But then I stop and consider the resistance is probably one of the big selling points of indoor training. Maybe it would be a motivating factor for me to ride more, train harder and actually have a different riding experience. Less utilitarian and more endurance. I already have Strava Premiere subscription, so I’m not factoring that into my budget. There’s space in the house for me to dedicate a spot to Zwifting. I even have a yoga mat I could use for the mat that everyone seems to show as well. Months ago when I talked with someone at a bike shop about trainers, there was a deluge of details about the back tire. Seriously! I couldn’t handle the info. By the time I heard about changing my back tire and rim, I was done. I don’t want to get into that. Get me to the Zwifting start line and if I’m using it so much I wear out the tire, well, I’ll deal with that when the time comes. Frankly, there are two potential bikes I could use on the trainer. One is my actual road bike which is a lovely carbon fiber Cannondale Synapse sweetheart. She’d love to be on a trainer. Poor dearie, doesn’t get much time at all. I am skittish as a kitten on ice when I’m on a road bike. Rollers are not an option. But we’ll talk about that in another post. I know I need about $100 for the incidentals like the Ant and other bits, but am I missing anything other critical parts? Here’s a great video from this guy, Shane Miller, I found on YouTube. This was extremely helpful. Shane goes through a set up from start to finish. I have checked CraigsList for a Cyclops or even someone’s cast off. I’m still in the research phase. I need to try out a few trainers and see how they work and feel. If you got out today, good job! I’m hoping we have some warmer temps in the forecast this week, because bottomline, I don’t like having my rides interrupted. Here’s to you! Thanks for reading. Get out there and ride or… Zwift.